Behavior Genetics is the leading scientific journal concerned with the genetic analysis of complex traits. BGA members have the option of free access to the on-line version of the journal from the Members Only page. Members should make sure to select this option in their Membership account page when they pay their annual dues. This timely journal disseminates the most current original research on the inheritance and evolution of behavioral characteristics in humans and other species. Contributions from eminent international researchers focus on both the application of various genetic perspectives to the study of behavioral characteristics and the influence of behavioral differences on the genetic structure of populations. 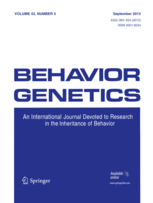 Behavior Genetics is published in cooperation with the Behavior Genetics Association. Please find here a listing of all Behavior Genetics Editors!